Zsa Zsa Gabor said, "I want a man who's kind and understanding. Is that too much to ask of a millionaire?" Bridge players want a partner who's kind and understands the game. Is that too much to ask? This deal would catch out many inexperienced players because there is a natural instinct to win any trick that comes by. Which one should South give away in this three-no-trump contract after West leads a fourth-highest spade six and East puts up the jack? The auction is straightforward, North choosing not to use Stayman with 3-4-3-3 distribution. Here, though, South is also 3-4-3-3, and four hearts should be made without difficulty. Declarer starts with five top tricks: two spades (given the first trick) and three diamonds. He can establish three heart and two club winners, but there is a risk that the defenders will first take three spades and two aces. The natural reaction is to win the first trick and to play a heart. Here, though, East takes that trick and returns his remaining spade, the contract ending down two. Yes, if South attacks clubs immediately, he is safe, but why should he? There is a reliable rule in this situation: If declarer has two stoppers in the suit led at trick one but must lose the lead twice before running for home, he should duck the first trick. So, South should let East take trick one. He will presumably return his second spade. Declarer wins and drives out the heart ace. 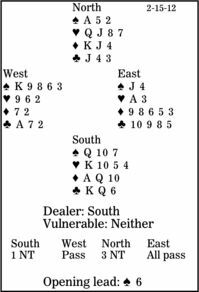 Here, East does not have a third spade, but even if he did, the defenders would get only two spades and two aces.